Our chef André has created this tasty lamb pilaf and given it a hearty boost with the addition of lentils. 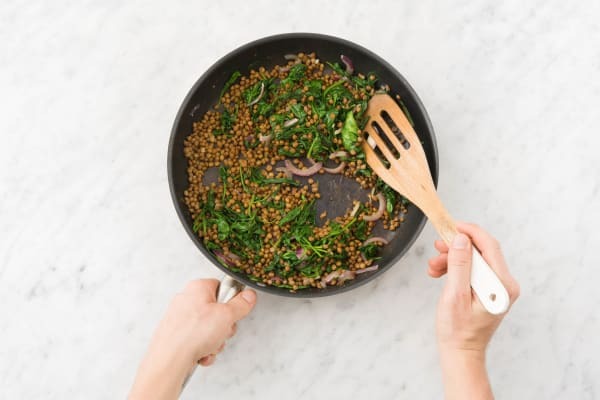 Lentils are a great filler in a dish, as they are packed full of fibre. The type of fibre found in lentils has fantastic benefits for heart and digestive health as well as keeping blood sugar levels stable. This dish also has a delicious flavour profile with zingy, minty yoghurt and hints of sweetness from the dried apricot. 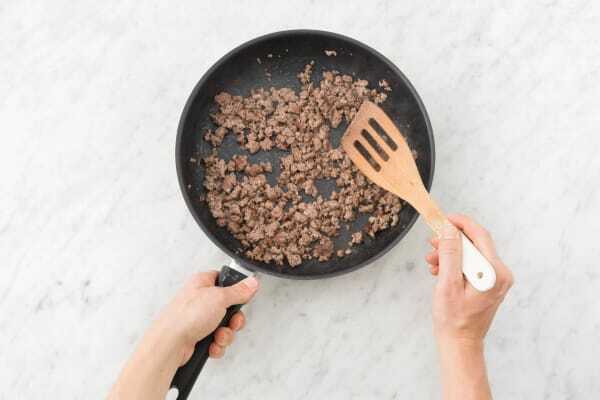 Heat a large frying pan over medium-high heat and add the lamb mince. Brown your lamb for 8-10 mins, breaking it up with a wooden spoon as it cooks. While your lamb cooks, get on with the rest of your prep. Cut the red onion in half through the root. 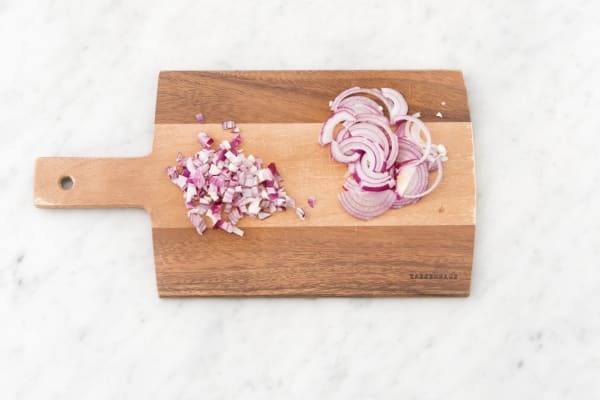 Peel and then chop half of your onion into small chunks (½cm is ideal). Slice the rest of your onion into thin half moon shapes and keep to one side. When your lamb has been cooking for 8-10 mins and is brown, add your onion chunks and cook for another 5 mins. Season with salt and black pepper then after 5 mins add the ras-el-hanout and half of the turmeric and cook for 1 minute. Next, add the basmati rice and stir well to make sure your rice is nicely coated in all of the spices. Then add the water (amount specified in the ingredient list). Bring to the boil and add the chicken stock pot and stir to make sure it is dissolved. Lower the heat until it’s simmering gently and then pop the lid on. Cook for 10 mins then remove from the heat. Leave for 10 mins off the heat to allow your rice to finish cooking in its own steam. This is your pilaf. Whilst your pilaf cooks, finish off your last few jobs. Peel and grate the garlic (or use a garlic press if you have one). Chop the dried apricots into small chunks. Pick the mint leaves, discard the stalks and shred the leaves as finely as you can. Drain the lentils into a colander and rinse under cold water. Keep to one side. Heat another frying pan over medium heat and add a splash of oil. Add your onion slices and cook for 5 mins, stirring frequently to make sure they don’t burn. Add the baby spinach and cook for 2 mins before adding your garlic. Cook until your spinach is completely wilted then stir in your lentils. Carry on cooking until your lentils are piping hot. Season to taste with salt and black pepper and keep to one side. Mix half your mint into the yoghurt and add a pinch of your remaining turmeric. Mix well and add a pinch of salt and a good grind of black pepper. Keep to one side. 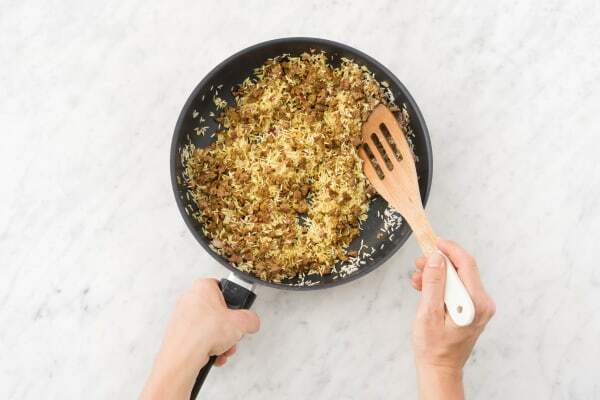 When your pilaf has finished cooking, fluff it up with a fork and then carefully add your lentil mixture and dried apricots to your pilaf. Add your remaining mint and a squeeze of lemon juice. Taste and add more salt, pepper and lemon juice if necessary. 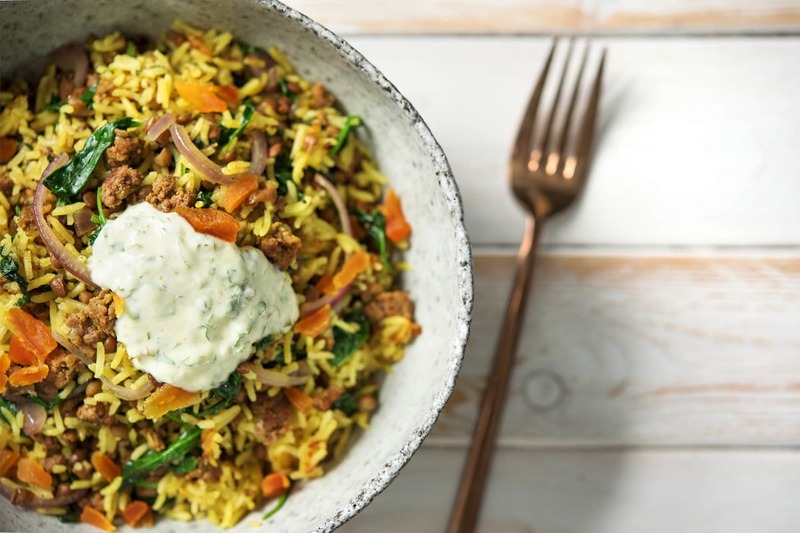 Serve your lamb pilaf in deep bowls with a generous dollop of your minty yoghurt and enjoy!